The 20 hour course Learn everything about car mechanics from our professional quality video series. Get 20x more in the course Only our video series will take you through how a car works in a structured and complete way. The valve which allows mixture into the cylinder is the inlet valve; the one through which the spent gases escape is the exhaust valve. They are designed to open and close at precise moments, to allow the engine to run efficiently at all speeds. In this design the overhead camshaft is driven by an internally toothed belt, and the cam lobes act directly on tappets mounted over the valves. The operation is controlled by pear-shaped lobes, called cams, on a rotating shaft, the camshaft, driven by a chain, a belt, or a set of gears from the crankshaft. Where the camshaft is mounted in the engine block, small metal cylinders tappets sit in channels above each cam, and from the tappets metal pushrod extend up into the cylinder head. The top of each pushrod meets a rocker arm which bears against the stem of a valve, which is held in a raised (closed) position by a strong coiled spring the valve spring. As the pushrod rises on the cam it pivots the rocker arm, which pushes the valve down (open) against the pressure of its spring. As the cam lobe rotates further, the valve spring acts to close the valve. This is called an overhead-valve (OHV) system. Some engines have no pushrods; the valves are operated more directly by single or double camshafts in the cylinder head itself the overhead-cam system. As there are fewer moving parts between the camshaft and the valve, the overhead-cam (OHC) method is more efficient and produces more power for a given engine capacity than an engine with pushrods, because it can operate at higher speeds. With either system, there must be some free play in the operating gear, so that the valve can still close completely when parts have expanded through heat. A pre-set gap tappet clearance is essential between the valve stem and the rocker arm or cam, to allow for expansion. Tappet clearances vary widely on different cars, and faulty adjustment can have serious effects. If the gap is too large, the valves open late and close early, reducing power and increasing engine noise. Too small a clearance prevents the valves from closing properly, with a consequent loss of compression. 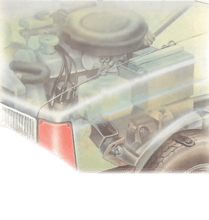 Some engines have self-adjusting tappets, which are hydraulically operated by the engine oil pressure. When the camshaft is mounted in the engine block, long pushrods operate the rocker arms which in turn open the valves. 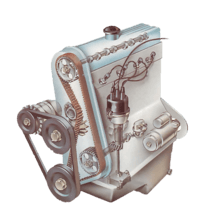 This overhead-valve (OHV) system is less efficient than an overhead camshaft because the number of moving parts limits the speed at which the engine can run safely. 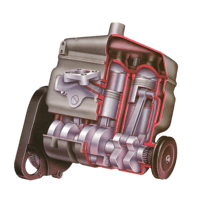 The overhead valve system (OHV) system, operated by pushrods, has the crankshaft adjacent and parallel to the crankshaft in the cylinder block. As the crankshaft rotates, each valve is opened by means of a tappet, pushrod and rocker arm. The valve is closed by spring pressure. The camshaft drive-chain sprocket has twice as many teeth as the crankshaft sprocket, so that the camshaft rotates at half engine speed. In some designs the cams act directly on short levers, called fingers. An overhead-cam (OHC) engine needs fewer parts to operate the valves. The cams act directly on bucket tappets or on short levers - known as fingers - which in turn act directly on the valve stems. The system dispenses with the extra weight and mechanical complexity of pushrods and rocker arms. A long chain is frequently used to drive the camshaft from a sprocket on the crankshaft, but such a long chain tends to 'whip'. The problem is overcome in some designs by fitting intermediate sprockets and two shorter drive chains, kept under tension. Another method uses a non-stretch oil-resistant, toothed rubber drive belt which engages with toothed sprockets on the camshaft and crankshaft. Stop wasting time on YouTube and get serious! Learn everything about modern cars from our new video series. Winter special: just $20 until December 31! We start by tearing down and then rebuilding the whole car. There's ridiculous detail on every part. Clearly and easily explained. We've created the most detailed 3D model ever produced so we can show you everything working. © 2019 How a Car Works.